If you know me then you know my passion for animals. I am also extremely allergic to animals. Ohhhh the cruel irony. I have found one type of animal with fur that I’m not allergic to–sea lions! And dolphins? No reaction! 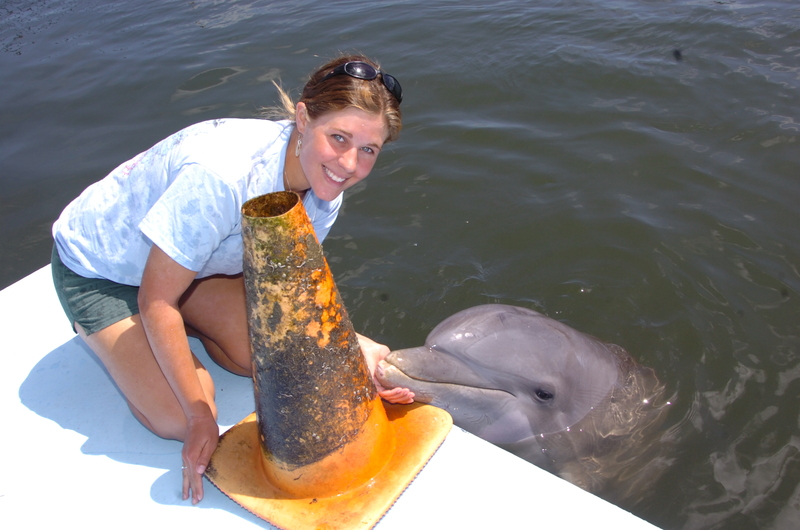 I moved to the Florida Keys in late 2007 to intern at the Dolphin Research Center. I had never touched a dolphin before, or even really seen one up close. 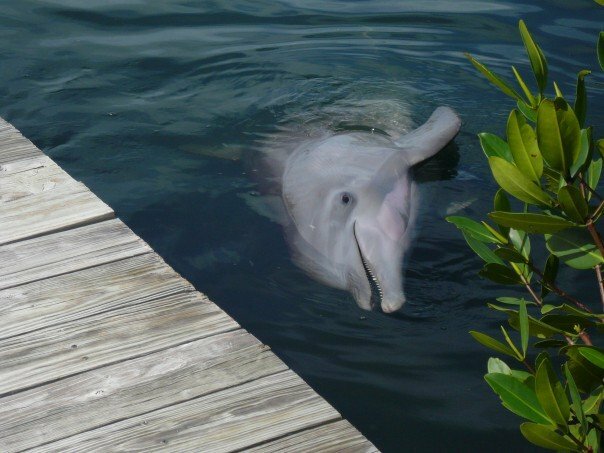 I will never forget the feeling of the smooth rubber-like skin under my fingertips the first time I touched a dolphin. I wanted to scream and cry with joy, but had to keep it in. 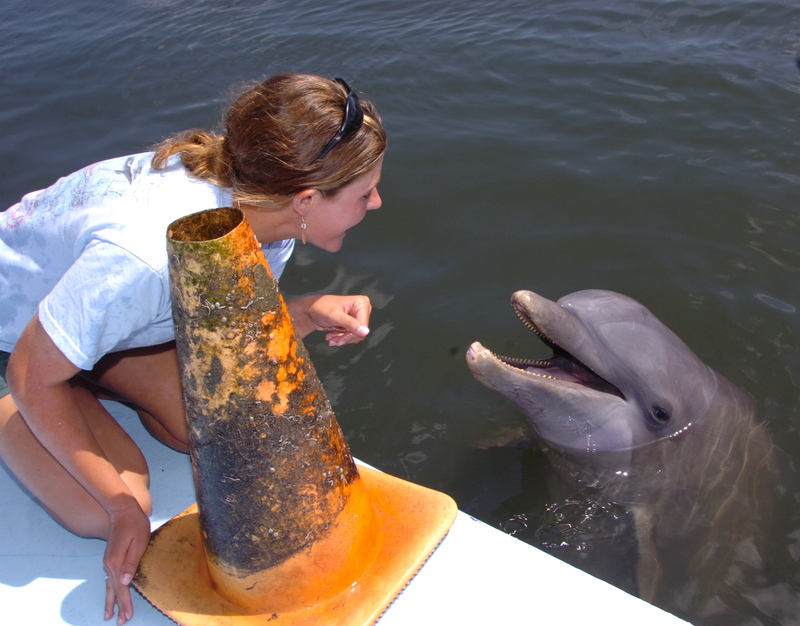 After all, I couldn’t let these dolphin researchers see my child-like giddiness my first day there! As the dolphins swam by again and again wanting more back rubs, I knew that I was exactly where I was supposed to be. The next few months only got better. The infatuation/honeymoon stage wore off and it turned into a deep love and respect for these beautiful gray creatures. I spent hours just watching the babies play with seaweed and mangrove pods. I held a 300 pound animal’s tail in my lap while she lay belly-up in the Atlantic Ocean. This is the ultimate trust from an animal–laying on the back is so vulnerable. However it was trust for me too; with a quick and easy movement, the dolphin could have “slapped” my legs with her tail and literally broken both of my femur bones. It was the strangest thing working with dolphins. They can be so human-like, its scary. I would be walking down a boardwalk and wave at Pandora, and she would wave back. 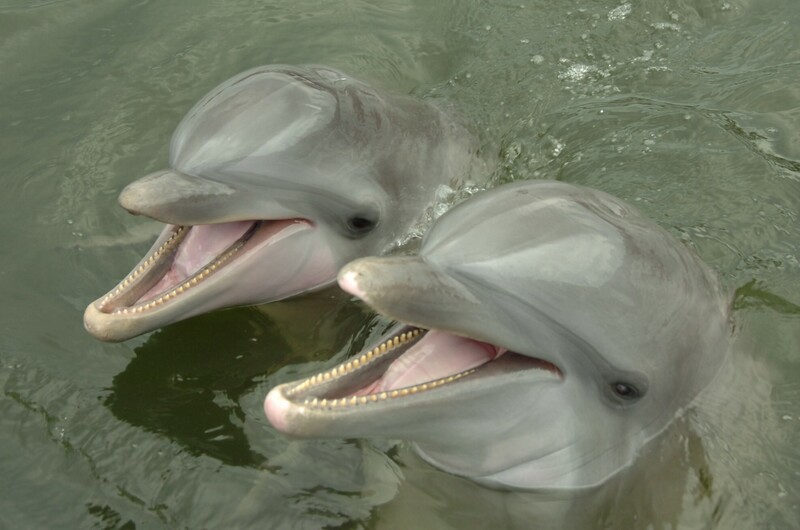 I would walk past Aleta and say “hey!” and she would scream a loud pitched “eeeeh!” Some of the dolphins would imitate a laugh, so if you started laughing for any reason, they started laughing. Then you would laugh harder, and they laugh louder. What funny and ridiculous animals! Another time I asked Talon for a present. Talon is a very big Flipper descendant. It shows in everything he does. He can jump higher, swim faster, scream louder, and tail-walk longer than most dolphins at DRC. After being asked for a present, Talon excitedly dove down the bottom of his lagoon. Talon was gone a LONG time. We started wondering if he had gotten lost or God forbid, stuck on something. Finally after a few minutes we saw him emerge and take a deep breath. He was clearly struggling with whatever he was trying to bring to the surface. Rick, the trainer, and I just about died laughing when we saw what he had. It took him several minutes to get it to the dock, but he finally did! It was a giant construction cone, you know the orange ones they put on the highway? What the heck?!?! How long had that thing been down there? HOW did it get down there? The cone was filled with seaweed and other slimy organisms, but we threw it up on the dock. Talon was SO proud of his present he screamed and took off diving around his lagoon. Maybe it was just coincidence, but I felt pretty darn special after these two occurrences. Tursi gifted me her baby and Talon spent minutes digging up a traffic cone for me. I would have been happy with a silly piece of seaweed or coral–but they went a little crazy! I don’t think I’ve ever loved a gift as much as these ones given to me by the dolphins! I wish this photo had sound! He was screeeching with delight! May 11, 2011 in All Posts, Photo. I love this posting! You went to DRC to validate your love of Dolphins, and left with a life changing perspective–0h yes, and with a man named “Isaac” ! :). Obviously the Dolphins (and Isaac) saw the inner beauty that God has so richly blessed you! So glad your Mom encouraged you to follow your dreams!